If you were stranded in the middle of nowhere, your chances of survival would be significantly higher if you had this equipment with you. 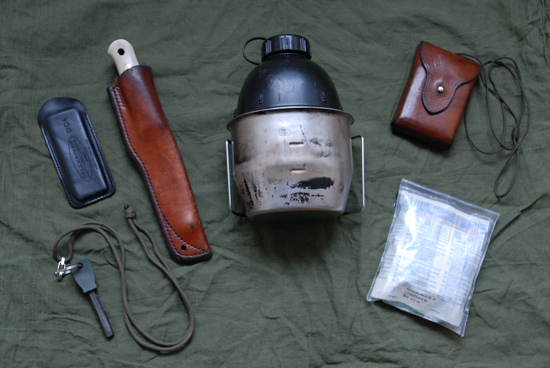 To me, however, these items are not just pieces of survival equipment, they are things I use everyday when I am living outdoors. They are well-used but also well-loved. With the exception of the first item – a knife – the following discussion of equipment is not in any order of priority or importance. Each item is important in its own right and could be more critical than another in a given situation or scenario. It shouldn’t be a surprise to anyone that a bushcraft knife is at the top of my list! Knives generate strong opinions, even amongst outdoors people. Many have a view on which knife is ‘best’ and almost everyone involved in bushcraft or survival has their favourite. I think most would agree, in general, a knife for wilderness use should be strong and safe to use, it should hold its edge well and be relatively easy to sharpen. To me, though, what’s more important than the knife itself is your skill in using it. In the hands of someone skilled in bushcraft, a good quality knife is an invaluable tool. The more skilful you are, the more you can achieve in a given period of time. If you can complete tasks and make items quickly and efficiently using your knife, then more becomes possible with only a knife. There is an old adage – “your knife is your life”. A robust knife and strong sheath are ideal for wilderness use. Photo: Paul Kirtley. There’s another old adage – “you are only as sharp as your knife”. A portable and efficient sharpening stone allows you to easily maintain a keen edge while in the field. A small whetstone that can be kept on your person is a good idea in case you are separated from the rest of your equipment. There are various options but I like to use a small combination stone that has a fine diamond powder on one side and a fine ceramic surface on the other. Diamond is quite aggressive and takes metal off your blade quickly. Ceramic is slow to remove metal but gives a fine, sharp edge. At 32x100mm (1.26×3.94”), the Fallkniven DC4 whetstone easily fits into a pocket. Unlike many sharpening stones this type of stone can be used dry. It doesn’t require oil or water while sharpening but does benefit from occasional cleaning with a little soap and water. Fire-lighting is a cornerstone skill of bushcraft and fire can be of critical importance in a wilderness survival situation. You may already be very familiar with the fireflash, also known as the Swedish Firesteel, but they do take a little bit of practice to get the hang of. I’ve met people who hadn’t managed to get consistent results with a fireflash and concluded they were “rubbish”. So, it’s still worth me highlighting the fireflash’s merits as a quick explanation of why it’s worth carrying one. This simple piece of kit has to be the most dependable means of producing a spark. Even if you are confident in lighting fire by friction, carrying a fireflash is prudent insurance in pretty much every environment you might find yourself. Unlike a box of matches or a cigarette lighter, the fireflash can literally light thousands of fires (the manufacturer reckons 12,000 strikes). A further plus point is that there are no moving parts to break. While it will corrode if kept damp for an extended period of time the fireflash’s effectiveness is not diminished by having been wet – ideal for wilderness use. So if the rain has soaked you through or if you fall out of your canoe, you always have the means to light a fire. The fireflash produces very hot sparks. They are much hotter than the sparks from traditional flint-and-steel sets. You can see this in the colour of the sparks produced – the traditional sets produce orange sparks while the fireflash produces bright white sparks. At nearly 3,000 degrees Celsius (5,500 degrees Fahrenheit), the sparks from a fireflash will light the widest range of natural and man-made tinders of any of the spark-producing gadgets. With caution, a fireflash can also be used to light gas and multi-fuel camping stoves. I would recommend the full-sized ‘Army’ model fireflash over the smaller ‘Scout’ or ‘Mini’ models for reasons of both longevity and ease of use. The full-sized model weighs only about 60g (2oz). The most dependable of fire-lighting tools. Photo: Paul Kirtley. When I pick up my knife and head outdoors, I also pick up a ‘cuts kit’, a small first aid kit that can deal with what must be the most common injury in bushcraft. Some people don’t bother protecting cuts but infection is a risk. When living outdoors for an extended period it is very difficult to keep your hands as clean as you do at home. I’ve also added a few other useful items to the kit including Wysi-wipes (a compressed, dehydrated wet-wipe) and painkillers (analgesics). Warning: You should always make sure that you are not allergic or prone to any other adverse reaction to any medicines you choose to include in your first aid kit. If in doubt, speak to a pharmacist or your doctor. Also, unless you are trained and qualified to prescribe or administer drugs, any medicines you include in your first aid kit should be for your personal use only and not given to anyone else. The simplest method of producing drinking water that is free of pathogenic organisms is to boil it. In the wilderness, boiling water without a metal container is tricky. So, if you always have your metal mug with you, you can easily boil water. Yes, of course you can use a billy-can or cooking pot if you have them but you are not likely to carry these on your person. I prefer an uncoated, steel mug. Non-stick coatings can retain flavours, which sometimes makes for some unpleasant combinations (although some people like their tea tasting of last-night’s curry…). Coatings also make it harder to keep your mug clean – using anything abrasive will damage the coating. The conductivity of aluminium is higher than steel so you are more likely to burn you lips with an aluminium cup, hence my preference for steel. In an emergency, you can manage without a water bottle if you have a metal mug or similar in which to boil water. In these circumstances, staying hydrated does become more difficult. Having somewhere to store drinking water is an obvious advantage, particularly if you are on the move. Under normal circumstances you should always have at least one litre of water-carrying capacity, preferably two litres. There are many mugs on the market and many designs of bottle available. A combination that fits together well, takes up minimal room in your kit and can be carried on your person when required is a real asset. A neat solution that I like is a NATO flask with a BCB ‘Crusader’ metal mug. This combination can then be fitted into a belt pouch and easily carried. I also slot a metal spoon in here. If the pouch also has a smaller pocket, as water-bottle pouches often do, you have the option of including water-purification tablets, coffee sachets, etc, in your kit. Bottle, mug and pouch - everything you need in one compact kit. Photo: Paul Kirtley. The compass is a simple yet very reliable instrument. A compass doesn’t need batteries, rarely goes wrong and should always be trusted. A compass has many more uses than just finding north. One of the key benefits of learning how to use a compass effectively is that it frees you to confidently navigate in unfamiliar territory. Silva Ranger 15TDCL. Photo: Paul Kirtley. The model of compass I have been using for the past few years is the Silva Ranger 15TDCL (Silva have since changed the name to Silva Expedition 15TDCL). 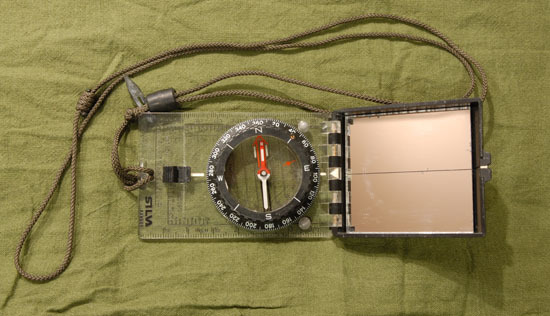 This compass has many features and the sighting mirror is useful for things other than navigation too. From getting something out of your eye to signalling for help over long distances, a mirror is very valuable. I keep my compass in my shirt or jacket pocket and it is attached with a lanyard. Implicit in all of the above is that these pieces of equipment should be easily carried with you. Your equipment mustn’t hinder you. The essential equipment you choose should be light and comfortable enough that you are never tempted to leave it behind at times when you should have it with you. Knife and water-bottle pouch. You can also see fireflash lanyard in my right pocket. The canvas pouch contains a more comprehensive first-aid kit than the 'cuts kit'. Photo: Amanda Quaine. There are situations while travelling in wild places when you might not have access to your main bags or backpack, particularly in vehicles, helicopters or light planes. Even going for a short walk away from camp, you should consider the consequences of getting lost in unfamiliar territory. There are numerous emergency situations you can envisage where you could lose your main equipment, such as slipping over and losing your backpack while wading across a river or in capsizing a canoe. Then what you have on you person is critical. Even though many of us like shiny things, bushcraft isn’t about gear. At the heart of bushcraft is knowledge and skill. Some gear does make the application of your knowledge and skills a lot easier and other aspects of your trips quicker or more comfortable. The more skillful, knowledgeable and experienced you become, the less you will need to rely on equipment and the less stressful it will be to lose some of it or have some of it break. That’s not to say you should be sloppy with your kit, though! What it does mean is that when you are planning a trip, you get to make the choice as to what level you want to rely on equipment and how much you want to rely on your skills and natural materials. Do you take a tarp or build a shelter? Do you take a stove or cook over a fire? Do you use matches or carve a bow-drill set? This is closely tied to the aims of your trip. Maybe you are after covering distance quickly and a modern, lightweight camping outfit is what suits you best? Or, maybe you intend to spend more time in each place, so you take a few tools and employ your camp craft skills to make many of the items you need around camp? Or, maybe you plan to test yourself, living from the land, relying heavily on your bushcraft and survival skills? For some people reading this, the idea of spending a night or two out in the woods with only the 7 items I’ve highlighted would be a nightmare. For others, this scenario will read like a holiday/vacation, as it’s something they’ve done, perhaps many times, and enjoyed. For others it will be an attractive challenge yet to be tried. Another engaging and well reasoned article. The two items that I’d add to a lightweight kit-list like this would be a whistle & light source. I carry a Fox40 whistle (very loud & no moving parts) and a tiny LED key-ring type torch on a lanyard around my neck. They weigh just a few grams and don’t hinder me in any way but can be very valuable. The whistle is for attracting help in an emergency and a torch makes patching yourself up with your cuts-kit or finding your dropped fireflash and many other tasks much easier than trying to tackle them in the dark. If I were to add 3 other items to round out a top 10 they would be; a small wash kit in a tin, a small fishing kit (just hooks and line) in another tin and an MP3 player with a bright enough screen to serve as an emergency light, loaded with Tangerine Dream. Ziggy, I wondered when someone would get onto the idea of food. You can spot someone who’s done the Journeyman course 😮 Fishing kit is a good one. How about including some wire in this too – could make leaders for fishing or snares? How about some Boards of Canada or Autechre’s ‘Incunabula’ to add to Tangerine Dream? A fishing hook could also be improvised from a rose thorn and fixed onto a line stretched across a stream or pond, I think, although not usually as effective as a proper fishing kit. Maybe paracord would be a useful item to add as while cordage could be made without too much difficulty, it’s useful to have a ready amount of strong cord, which could be invaluable for a bow drill as some natural fibres aren’t resilient enough. Just a personal preference. I’m ,only 13, so I’m not so experienced as to produce long lengths of cord quickly. The metal cup is also a firm favourite of mine for brewing some hot chocolate out in the woods. Thanks for your comment. It’s good that you are thinking about these things – I think you are right to value good, strong cordage. It can be difficult to create/replicate from natural materials. And even the best plant-fibre based natural cordage is not as resilient for bow-drill. Rawhide on the other hand is excellent. Like modern cordage, rawhide is something which would have to be manufactured and carried with you. If you have a look on you tube there were a few vids showing how to make a para cord belt. Sorry but i can’t remember the details except that you could carry a lot of cord for emergencies. Steve, thanks for your comment. Good, practical suggestions. I like them. Fox 40 is very loud indeed. They should come with ear defenders! I would ad just 3 things too your list . A small forest axe on a round leather loop, a canvas dropbag for gathering items and a 10meter paracord 5string for different use. Thanks for sharing your additions. As Steve has mentioned above, I carry a whistle, Fisher Space pen and a small Inova micro light in my first aid kit, otherwise it is a basic kit list you just can’t argue with and the minimum base items that make life not only possible, but comfortable too. I don’t think I can really add to that. Jonathan, glad you liked the article. A pen is an interesting one. Being able to make notes or sketch maps could be important in some situations. Good stuff! I thought the idea of honing your fireflash skills on a candle was a great idea. Good tip for anyone else trying this though, is to avoid using the other halfs large scented church candles. Apart from the fact that it is difficult to light a wick in a pre burnt 4 inch diameter candle with a gaping crater to the wick, you also tend to leave a load of unsparked ferrocerium in the bowl which gives out tremendous results when someone comes to use it. The other half is reading!!! Girlies love bushcraft too!!! So going to try practicing. Think I’ll start with my citronella candle. Great idea thanks for the tip. Got my forest school assessment week coming up soon. Quick and easy way to practise. Thanks guys! Interested in the firesteel-I love the metal striker and have put a slight edge on the ‘handle’ (not the smaller striking bit). I find flicking the striker off the very end with my other thumb is for me, about as good as using a knife. Talking of knives, I’ve recently got a bespoke one so your first aid kit info is timely! As the years progress I carry less kit than I used to. However narrowing down to a top ten is tricky.I go with ‘Paul’s top 7’ in essence.But would add a mobile phone, a headtorch and a small forest axe. I feel happier with a mobile about me, when I am out any where. It affords me a higher degree of confidence ,especially in an emergency and the ability to change my plans and let those at ‘home’ know. Although my phone is rather basic many have GPS , backlights , internet facilities etc. Not very bushcrafty but very practical ! As mentioned previously the head torch is a must . Although the knife is a very versatile tool in the right hands.My Gransfors B. Small Forest axe allows me to perform many tasks in a much more efficient manner. I would also use the versatility of my First Aid kit to include items such as Safety pins (fish hooks), spirit based wipes (firelighting) etc and some emergency Topic Bars/chocolate ! It’s true – we are all different – and we should embrace that. I’m surprised it’s taken so long for anyone to mention a folding saw. Paired with a knife it’s a powerful combination. An axe is certainly more useful in the northern forests than in warmer/tropical zones. In the boreal forest, particularly in winter, the axe is more important than the knife. The slower growth of trees due to the shorter growing season means growth rings are more tightly packed than at lower lattitudes. Some wood will be frozen. To stay warm you need a lot of firewood. You end up using your axe a lot. Mobile phones are certainly useful for personal safety. Unfortunately some inexperienced people misuse mobiles to call out resuces because they are ‘tired’ on Hellvellyn or similar. Some places in the UK still don’t have good coverage though and in remote areas, overseas you can lose reception altogether. Then you are into the realm of satellite phones. If you are in charge of a group, however, you should have some means of communicating with the outside world. Most people would view you as naive or negligent if you didn’t. A headtorch is very useful, particularly in the winter months, and the modern LED torches are powerful and so light in weight that you can carry them and hardly notice. A torch increases your safety in the dark allowing you to do work you wouldn’t otherwise be able to do (such as finish a shelter for the night). A torch also allows you to signal. The discipline comes in using a headtorch sparingly so that you don’t run the batteries down too quickly. A larger first aid kit can indeed contain extra items – the kit you can see on my belt in the picture in the article contains not only bandages, etc but also a Petzl e-lite headtorch and a cigarette lighter. Great responses guys. Keep them coming! The carrying of my GB axe has almost become habitual for me. The points you make are very valid though. A lot of what and how we go about our ‘outdoor activities is based on the actual environment we find ourselves in, personal preference , skill levels , comfort zones and taught influences. I find myself doing a lot of Campcraft and find the axe invaluable.When in a location I tend to carry it in an axe ‘loop’ on my belt , but I guess , I would nearly always go out with a ruck sack/bag etc and would carry ‘all’ my kit ( perhaps item numbers 4-10 plus essential clothing) in that . Although I would leave the knife, fireflash and first aid kit on my belt . I have to say I attended a Campcraft course with Paul a few years back now and have never looked back , as far as axe use is concerned. So I ‘ll blame Paul as a ‘taught influence’ ! If we counted a Food item as an essential piece of our ‘possibles kit’ for either morale or nutrition or both….What would you carry ?……. It would be a slab of Dark Chocolate for me !!! I know you are covering ‘wilderness’ kit, but there is also another way of thinking about ‘things I never leave home without’. When going about my daily business, I have three things in my jeans pocket at all times – cheap disposable cigarette lighter, standard size (non-locking) Swiss army knife and chapstick. The lighter and pocket knife should get me out of a few scrapes. And then there are the odd bits of very worn stuff that I stash in my car that I optimistically call my ‘ditch kit’. I should probably take a look at that and organise it a bit. If I am flying then I leave behind the pocket knife (for the most part I try to travel with only carry-on luggage, unless I am doing something outdoorsey when all the sharps go in the hold), leaving me with my lighter and house keys as my only tools. I do get separation anxiety without the knife in my pocket. I have never been asked to empty my pockets by the police, but feel I can justify a standard size Swiss army knife if that ever happens – even in a pub – especially a non-locking variety which the UK has seemed to gone weird over. If I am out for a walk in the woods I might swap it for a larger locker and chance it. I used to have a dinky little torch on my key ring and should probably go out and find a good one again. I’m glad you liked the article and thanks for your comment. I like the idea of an everyday ‘ditch kit’. I also have a small Swiss Army knife on my keyring with my house keys. It’s a useful little blade along with scissors, tweezers and a pen. From a survival point of view, I think that any knife is better than no knife! I used to carry a stick of Swedish ‘Hudsalva’ (which you can actually eat/cook with) but it melted all over the inside of my trouser pocket and keys – it was a real mess! So I reserve Hudsalva for where it works best – colder climes where ordinary chapsticks just go solid like candle wax. The little Photon microlights with variable brightness control are very good. How weird, or maybe totally sensible, but Steffan and i carry the same three things around daily… for twenty years i have carried a small lighter, chapstick, and a swiss army in my pockets daily… i carry the hiker because i like having the saw blade, but the super tinker was my carry for many years and i keep a spare super tinker in the cruiser at all times… if i’m serious or hunting/fishing or whatever i may carry the SWC or one other of my fixed blades, but i feel naked without the swiss… when i fly i have bought another upon arrival… how do men NOT carry a pocketknife ? i make my wife carry a ST in her purse ! Found that a great read, thanks! Something i often carry is a little tinder – most often birch bark – in a small pouch. Not only may it save time in fire lighting, but i like to be prepared. So i keep the tinder close to my body, in the hope that that reduces the chance of it getting too wet. That’s a very good idea. Having some decent tinder on your person can indeed speed up the process. Preparation is certainly the key thing to remember for firelighting. Do you use one of those tobacco pouches for your tinder? I use a small leather pouch/bag to keep tinder in. Ive looked for the ‘baccy pouches, but am yet to find one. They all do the same thing tho! A couple of items I would consider adding would be a lightweight poncho and an emergency space blanket. The poncho (apart from it’s obvious use) is also quick shelter that can be adapted to what’s around you to get yourself out of the elements. The space blanket could be used underneath the poncho to reflect heat from the fire back down onto you when resting up. It could also be used for signalling (marker panel, or waved for colour, contrast and movement) in an emergency. This is good thinking. Shelter is a basic need and having some materials that can provide shelter in themselves or add to an improvised shelter would be valuable in many situations. I also like your thinking about items having multiple uses. It’s always good to consider this. Hi again Paul – a follow up. A bought some wysiwipes and they are so cool! When do you tend to use them? For cleaning up a messy wound with water from your canteen? Also got the current Freedom Photon Microlight – they have improved significantly since I first had one. Question for you about wearing your belt kit (heavy water bottle) – it’s not something I have not tended to do myself in the past – but when I did I always used a separate belt. No problems with it getting in the way of your pack? In the same vein – do you know anyone that sells a drop for the belt sheath. I want to get the knife a little lower and further from my pack and with some articulation so that it keeps out of my way. Wysi Wipes are quite absorbent and, in the context of first aid, I use them for wiping and mopping. A few drops from a water bottle is all you need to get the wipe expanding. Just avoid using your water bottle to wet a wipe that is used on someone else. There are obvious cross-contamination dangers. 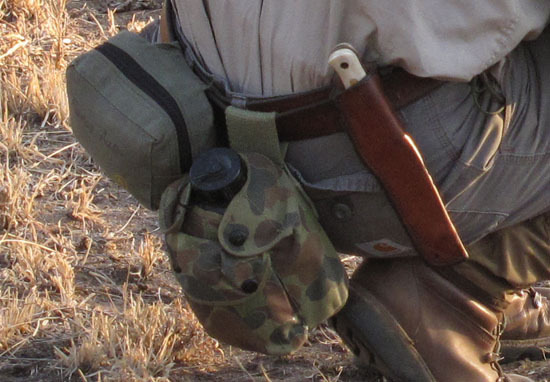 In answer to your question about having a heavy water bottle on your belt: I tend to wear it on my belt when I don’t have a pack on, particularly in hot climates. If I do wear it when I have a pack on, the belt-loop on my water bottle pouch is a dropper loop so it will hang low enough. I do always use a second belt in addition to my trouser belt to carry a water bottle. Leather belts are OK but in hot climates I find they get wet and uncomfortable from sweat on your lower back. In these circumstances I prefer a light webbing belt such as the models produced by Blackhawk Industries. For the belt sheath, I wouldn’t recommend going to the expense of purchasing a second sheath. You can make a simple, strong dropper from paracord. Take 30cm (12″) of paracord and make a closed loop, tieing it off with a double-fisherman’s knot. Pass the cord loop through the sheath belt-loop so you end up with equal amounts of doubled-over cord showing on each side of the belt loop. You have formed two cord loops that should then be slotted onto your belt. Your sheath will hang below your belt and be articulated. If it hangs too low, shorten the cord. If I’m walking with a day-pack, I keep my knife on my belt. If I’m walking with a heavy back-pack, when the hip-belt of the pack is transferring much of the load onto my hips, having a knife on my belt can be uncomfortable. Also access to the knife is difficult. Then, I take a longer loop of paracord, pass it singly through the belt-loop, tie it off and hang the knife around my neck. Thanks for the follow-up points and questions. I hope this helps. Hi Paul, great tips on the makeshift dropper. I wasn’t thinking of getting a new sheath, and contacted Ben Orford at www dot benorford dot com. He made one up from brass and leather to match the colour of my existing battered sheath for £15. P.S. is there a way to subscribe to comment threads here? Can’t seem to find it. I’ll sort the comment subscription option. Is it RSS you are after? I’ve added an RSS feed for comments. You should be able to see it below, just above the comments form. Hi Paul, i was actually thinking of an email notification whenever there is a comment in a thread that one has contributed to – but I guess I am being picky! The german Army used a heavy model of cotton trousers in olive green, till today produced in army quality in several colours by Leo Köhler. Since 25 years they use a lighter version in the german woodland spot camouflage called Flecktarn Feldhose. That has about 20 or 30 percent plastic in the cotton webbing, so they dry two times faster than the old heavy ones. Both models have a very nice feature: In the right leg side pocket (INSIDE the pocket(!) next to the knee) of this trousers you find a small extra pocket where you can store a 9.5 cm fix blade belt knive in the scandinavian design like the knive from Paul at all photos. To wear the belt knive in that pocket is very kompfortable, very smoothy. And because that (in my opinion: full size) knive is hidden to everybody that is in my opinion the most aduld way to carry a fix knive in civilised countries. And you cant loose it. But you have very easy and fast access. And it is tecnikly compfortable, in all circumstances, with rucksack or without, in grandmas armchair and in the sleeping bag. I sleep on my knive in that pocket without problems! The shirt that suits is called Flecktarn Feldbluse. Because it has only two pockets you can wear it inside or outside the trousers depending on the weather. I choose the size for the shirt larger than the army does. They wear pullover an parka over the Feldbluse. I wear tshirt, thin fleece jumper, thin fleece jacket under the feldbluse, which protects against wind, dirt and sparks. And over that i wear the lightweight raincoat or lightweight military pocho. I use the parka only in winter lower than 5 degrees Celsius. I did not try it yet, but i heared, it would be possible to coulour the material in black or dark green at home. The shirt costs used in very good condition about 6, the trousers about 12,- € in germany. (2016) the prices are rising, because germany changed a couple of years ago from a service for everybody army to a professional army like britain and france. That means: The standard stuff slowly will be sold out! And becomes expensive! Of course you can add such a special pocket for the knive easily in the side pockets of the most trousers. That surely is better than every other way of carrying a knive for a bushcrafter. Only if you work for hours with the knive and need every 5 minutes both hands free, it would be better to carry it on the belt. I am very convinced about that, you should try that! I’m a bit late to the party as most of my items have already been mentioned. I like your list, but in my cuts and scrapes would have to add some small needle point tweezers for removing splinters. I always carry a credit card sized piece of BCB tinder card, it only takes a piece the size of a postage stamp to start a fire with a single spark from a fire steel! For cutting I use a diamond steel and give the blade a couple of strokes each time I use it and my trusty laplander for heavier cutting. I also carry as much 3mm paracord as I can can carry conveniently, usually about 20m. I know many of these items can be omitted, but they are so much more effective. Fortunately I have never been in a true survival situation so I practice using natural tinder etc. but if I’m cold and tired why not cheat a bit! Welcome to the party! This article is still generating a lot of interest. I received a couple of emails about it yesterday too. Tweezers are a very good addition. I like the Sliver Gripper tweezers – very useful from removing splinters to removing ticks. You can pop these in your cuts kit or clip them onto a lanyard around your neck with photon microlight and fireflash. Some man-made tinder is a good one. I also often have some waxed paper tucked away somewhere. As you say, it can speed things up a lot, whatever situation you are in. Laplander! Thanks, you are the first to mention a folding saw. A bushcraft knife and a folding saw is a really powerful combination. Paracord is such useful stuff. Funny you should mention it on the same day I was writing in my forthcoming article about how important a hank of paracord can be. These are great additions to my kit list. Again, this is a great article. It helps to clarify what is essential and what would make life easier. I wish I would have had your list prior to the overnight exercise on the Applied Bushcraft course! Anyway, just wanted to let you know I spent a couple of hours trying to light a candle with my fire flash and knife, whilst watching TV. I did manage it once and I was chuffed. I tried again the following day and managed to embed my knife into my index finger of my left hand. Unfortunately my knife was sharp and I now have a sizable cut. On the positive side, I can now produce a much larger spark. Hi Matt, I hope your finger is healing. And your pride! Well done with the spark production though. Another great article Paul. I suggest that a Millbank bag would be a good addition to this kit, or to your survival kit you describe in another post. I know you can always improvise something to filter out the larger bits of debris from your water source, but Millbanks are very light, don’t take up much room and work very well. Along with your means of boiling water you’d be sorted then! Good suggestion. As you say, you can of course improvise – for example tie off a trouser leg or use other tightly woven fabric in an emergency. But it’s nicer to keep your trousers on! A Millbank bag would be a good addition, particularly if you plan on boiling as part of your everyday water preparation. At the risk of being uncool and “un-bushcrafty”, I would add one essential item: cell phone. At least in our déveloped countries. It was probably implicit and left that way because of the explicit focus on bushcraft. But if you think “survival” then it needs to be on the list. Nice Article Paul, One thing that no one has mentioned is a mobile phone is great and I always take one, but coverage can be a bit poor, I like to take my 2m/70cm dual band amateur radio hand held. You would be surprised how far 5 Watts RF can get you, and it’s very easy to get your foundation radio licence, quick exam job done. Can easy make a larger antenna from 300ohm twin lead, hook it up in a tree and works 3 x that of the standard rubber duck antenna that comes as standard. Not very bush crafty I know, but more survival. Just a quick tip about my cuts-kit. I found that the little roll of micropore tape I had was a bit too deep and stressed the aloksac so that it tended to pop open. Solution? Just unwind the tape onto a small piece of card so it is now a wide, flat ‘roll’ that fits in much better. I’ve done the same with some Gaffa in my survival kit too. Great blogs Paul, and sound advice. I’d give a second vote for the Millbank bag; mine lives in the front pocket of the water bottle pouch. Other items I always have, even at work, are a Swiss army knife, Zippo and some cordage. Welcome and thanks for your comment. Millbank bags are definitely a good basic piece of kit to have with you. In the photograph of the Silva Ranger it looks like there is some form of ‘spike’ attached to the retaining cord? What is it? Additionally that cord on the ranger looks like the same stuff used for certain brands of Australian Hootchie guy rope, do you know where longer lengths of that cord can be be baught? The Silva Ranger 15 TDCL has adjustable declination. The ‘spike’ is a small plate of aluminum (ie non-magnetic) with which you can turn the little brass screw (at NE) to adjust the declination setting. Who makes the leather case the compass is in? Is it custom or military surplus (ammo pouch?)? Great article, but there is 1 thing that a lot of outdoors people forget, or just never mention. And that is having a good sturdy thick Belt ! .. a person could never carry his or her daily gear like a Knife, firesteel, small first aid kit. A good belt IMO is a must. Out of all the books i have read no one mentions having a good Belt, lol. I bought a very heavy 2″ belt with a strudy buckle. I got tired of buying those 1″ dress belts, they just break down after a couple of years of being out in the bush. And i spent $ 50.00 for it. I bought my new heavy belt for $ 30.00 its not fancy just a good thick piece of cow hide. Once again, awesome Blog Paul always enjoy all the stuff you write & post. Yep, a good strong leather belt is hard to beat and is my usual choice. You can see mine in one of the pics in the article. The only time I question this choice is when it gets soaking wet – they can take a long time to dry out…. Because a leather belt is better than a canvas belt, and we both decided that as we only had this decision. Since one year I use the “Decathlon Solognac X Access Belt” plastic webbing, flat closure, olive green or beige, 100 kg pulling force, faster drying than a fleece jacket. It costs SEVEN EURO!!! I do not understand, why that closure works, but I can tell you: It simply works! great article and an excellent site. Thank you Paul Kirtley !!! I’m really pleased to have come across your web site. Could you possibly share the details of your leather case for your compass, as protection of something so important is always on my mind. I usually only have the small Nato button compass with me. Many thanks Paul. Thanks for your comment. I’m glad you are finding this site useful. The case for my Silva Ranger compass is from Woodlore Ltd. but you can easily make your own from a sheet of leather. Simple folding and stiching is all that is needed. You can add an extra ‘flap’ on the back if you’d like to create a belt loop. 6. Large, bin liner (aka garbage bag) (few cents). You still have change for some fish-hooks or a reel of snare wire. Hey, I’m dead chuffed. I’ve just read this article again and picked up on the bit about which is the best bit of the knife blade to use for striking sparks off the fireflash. I’ve tried using the back of the blade before and got nothing, this time I got some big sparks. Then I thought right, wonder if you really can light a candle with one. Third spark hit home. I’ve spent years trying to light fiddly bits of tinder and scattering it everywhere or taking lumps out of the back of my knuckles. Now use that technique on all of your tinder; you’ll have much greater success. And you’ll keep more of the skin on your knuckles…. There is a lot of detail in my articles. You’ll get the most out them by coming back repeatedly, having tried things or having experience of certain aspects that I’m describing or discussing. Thanks for your comment and please let us know what else you find useful. Great article and nice blog! Could you tell me where you got your water pouch from? It looks like an excellent piece of kit! I would add some sort of small shelter aid such as a space blanket or the like. Still, you seem to have it all covered… great stuff and cool gear! Glad I came across you blog… keep it up! Yes a sheet of plastic can be useful in aiding shelter building. The ability to make repairs, particularly to clothing is important. I always have a needle or similar in my first aid kit too – for exactly the same reason as you recommend them. hi paul being new to bushcraft i just wanted to say after reading all these coments about belt kit .what i carry on my belt .the first is my possibles pouch and fire kit including strips of old inertube .great even in wet conditions a small jar of vaselene coated cotton balls my second pouch is my cuts kit very similar to yours my third is my knife and fourth is my water bottle and mug as well as my laplander saw.great blog . Welcome and thanks for your comments. It’s interesting to read how you organise your most important personal kit. Thanks for sharing and thanks for your feedback on my blog. Hi, I was wondering where you got that water bottle holder? I have the NATO water bottle and metal cup, which I have grown to like more than the American version. However, all I can ever find here in the states is the zulu holder, which I dont really care for. I like the style you have there much better than the one I have. Was wondering where you got it? Thanks! I’m just learning to use compasses (I bought a Recta DP6, virtually indestructible) but I’m unsure how to store it, both at home and on the trail. Although I don’t carry magnets when about, I’m still afraid my compass gets affected by magnetism somehow and loses its reliability. How do you cope with this? And at home? How do you store it? Ideally, I would like to store it in an anti-magnetic bag or something, but I’m fairly sure that doesn’t exist. You are right to be careful with your compass. Even though there are some tough designs out there, they are still precision instruments and at their heart quite delicate. 1/ Local magnetic fields making the compass inaccurate at the time of use – for example, using your car bonnet as a map table before heading out for the day (on the wrong bearing! ), taking bearings near fences with metal wire in them, locally strongly magnetic rock (such as on the Isle of Skye) or metal on your person such as belt buckles, knives, phones, etc. Mobile phones can be a particular problem and it’s often the cases which are the main culprit as many contain magnets which keep the case closed or interact with the phone. 2/ Strong magnetic fields causing permanent inaccuracy of the compass. This can be caused by magnets in mobile phone cases if the compass is kept close by in a pocket but it is in around very strong magnets you need to be especially careful. While mistakes such as highlighted in 1/ can be serious for you, your compass will return to normal afterwards, while the full effect of 2/ on your compass will be to reverse the polarity so that north becomes south and south becomes north – i.e. the needle is pointing the wrong way by 180 degrees. You can check for this by comparing your compass with other indicators of direction such as the sun or the other star or, on a clear day, just careful comparison between your map, the land and your compass to make sure it all agrees. What can also happen in the case of 2/ is that the polarity of the compass needle is no very strongly reversed and is therefore does not respond quickly to the Earth’s local magnetic field, making it slow to move and slow to settle down. So you should keep an eye out for this type of behaviour from your compass too. To avoid the type of trouble in 1/ you just have to be careful and mindful of your surroundings when you are reading your compass. To avoid the type of trouble in 2/ keep your compass away from very strong magnets such as in loudspeakers or cathode-ray tube televisions or monitors. One more question though. In the second scenario, where magnets can cause permanent inaccuracy, will the needle always be reversed/180 degrees? Or is it also possible to get a slight, although permanent, inaccuracy of let’s say 5 degrees (or anything in between 1 and 180 degrees)? Although my iPhone-case doesn’t have any magnets, my phone apparently does. Tried it with an old compass. I never even knew that. I guess neck carry of a compass is the safest method for me. Since the most likely nearest metal source is the knife and PSK on my belt. Ps. It’s absolutely great your responses are so thorough. It definitely shows your enthusiasm and passion of teaching bushcraft/wilderness skills. I’m happy that my response was useful. And yes, I always do my best to help people with their outdoor skills. It’s what I love doing! Thanks Paul great advice. My extra item would be five hamlet cigars. Dont get me wrong smoking is a filthy habit and it’s eighteen years since I’ve had one, but if I am ever in a situation where I have to get the kit out and use it in earnest I would want something to make me sit down and take five minutes to assess the situation and decide what next. 1/ I would replace the plastic canteen by a metal one. Weighs a bit more, but more usablility (use for boiling, make charred cotton in it,…) and more durable than a plastic one. 2/ I would wrap some 550 paracord or bankline over the knife sheat, or add some at your compass or fire steel, just in case. Hi,First and formost,My Remingtron 700,and 20 rounds.very important in the forests I venture into!Then the “BAT BELT”with my bits n bobs! A solid and practical solution. Thanks for your article Paul. Along with everything you suggest, I carry a Map. Keep on writing; I’ll keep on reading. Yes, a good map is invaluable. Hello Paul,I have found that your articles are nearly as good as having you there to instruct and advise,I have started to enjoy my times in the woods and countryside as a great stress reliever and a way of recreating my scouting activities of many years ago. Your article on 7 items to take with you at all times was quite an eye opener but fairly obvious if we think about it logically,as I have definitely been taking too much kit out with me lately.What I like to have with me is my pocket stove as it fits in my first aid kit and my snugpak all weather shelter,it has all the bits that you need and it folds up small and fairly lightweight. It is a good test to pack my bag the day before I go into the woods and to resist the temptation to repack it with some extra goodies that will not get used and weigh me down. That’s very kind of you to say. I’m glad you are getting so much out my articles and I hope you continue to do so. A stove and shelter are very sensible additions to your daypack. As you say, thinking about things logically (and having some packing self-discipline) is definitely the way to go. Iodine water purification is available as a two part mix kit on e-bay, potassium permanganate has its uses but BE CAREFUL with it! I tend to use OASIS tablets as supplied in UK/NATO forces ratpacks. They deal with the water on Bodmin/Dart/Exmoors. After seeing a friend suffer terribly from drinking untreated water from an area on Dartmoor I can vouch for these little beauts. Agreed re pot perm – be careful. Good feedback re Oasis tabs. As with any chlorine-based system, readers should note to make sure the water is as visibly clean as possible before adding the tablets. Whenever I go out in the woods, people I meet are not wearing the latest and greatest bushcraft clothing; they are wearing blue jeans and hoodies. The people I meet are not equipped with the latest and greatest gear; they carry discount store items or hand-me-downs. What I like about your article is the economy of the gear you suggest. You gave me a benchmark for quality gear and I appreciate that. It’s good to hear from you. Thanks for your feedback on this article. It’s a core list that has stood the test of time as a benchmark for me and others I work/travel with. I’m glad it has been useful to you too. Very nice article. All practical items and covers the essentials. I have 4 more suggestions that people could try. These are all really just additions to the items you have already listed. 1. swiss army camper knife. It has the saw blade which makes it twice as versatile as a standard small folding knife. 2. A small shoe polish tin filled with Vaseline. I suppose this fulfils much the same needs as the chapsticks already mentioned, but with a few other uses. It makes great fire starter when rubbed into kindling or feathersticks. I’ve used it to free up dirty stuck folding knives and saws. When my hands have ingrained dirt its great to rub some in a few minutes before washing. really frees up the dirt. 3. I made a close fitting stove for my crusader cup from an ikea style cutlery drainer (mine was £2.50 from a cheap store). All I have done is cut the top of to fit the height of the crusader, then pushed in the sides to fit around the cup. I then cut 2 steel tent pegs down to fit width ways across the upper holes. they support the cup when being boiled. Small thumb sized cuts of wood work great, as do pine cones, allowing for far less wood to boil the cup than any open style fire. It fits snugly round the cup with the pegs down the side. It may be to tight with some pouches tho. 4. Small 1cm wide roll of brightly coloured electrical insulation tape. Cheap as chips (about £1 a roll or less). Has almost infinite uses. In the past I’ve used it to; act as plaster round fingers, repair small holes and tears, emergency covering around thread whipping, and my favourite use…small pieces stuck on anything that I may put down and lose! In a survival situation it would make ideal location marker. Its very easy to peel of, and doesn’t leave any marks on most surfaces. I suppose a lot of the items people carry as their basic kit are dependent on individual needs and also very much on personal opinion. I, for instance, rarely carry fixed blade knife on my person, but have it in my pack. in fact I will more often have a cheap, light pair of pruning shears. It’s good to see that your so open to others views. After all, we only learn from our differences! Thanks for sharing Andy. Much appreciated! and lamp, saves on batteries and some candles just as a back up. Hi Paul, one thing that I always have in my pack is a HB pencil with 2 wraps of Duck Tape to a thickness of about 15mm around it. Used it everywhere from on the doorstep here in Wales to Kilimanjaro for allsorts of situations (even used it in work in the past with a pad as an emergency wound dressing). Great website btw, only just found it, so plenty for me to read up on. Great discussions ,comments and ideas. My adventures in bush craft have taken most of 50 years to accumulate. So my thoughts today of outdoor adventure is more than just survival . It is survival in comfort. By that I mean, comfortable within myself about my ability to shine in the wilderness. A confidence that can be achieved with experience,and practical knowledge of your surroundings. It is also important knowing your self and your limitations. Your growth through experiences out there alone, with a companion or with a group, can give you an understanding that is in itself a stress reducer and that provides you, and those you are with, a calm level headed attitude about your situation and your surroundings. When you know that something will happen, it is also wise to know why it is happening and what your options are to improve, avoid, or experience a new event without fear or better yet, to have a laugh at the expense of one of your companions. So regardless if you take 3 cherished items with you or 10, your brain and knowing how it works,how it handles stress ,what it remembers and generally how it functions is by far the most important item you can possess. Very nice comment. Thank you. I`ve just recently discovered your blog & I`m finding it very informative ! I`m also enjoying your 20 free videos. Just an observation: I noticed your cup in the top photo is not black. In one of Mors Kochanski`s videos he mentions you will use approx. half the fuel if your pot or cup is black. In another video the author suggests painting the outside of your cooking vessel with ” Black hi-temp paint”. Thanks for your feedback on my blog and introductory videos. That’s a good observation regarding mugs. I would certainly agree that black cooking pots and mugs are more efficient than shiny ones. All the billy cans we use on our courses are blackened through repeated use. They are clean on the inside though. We ask students to return them in the condition they were issued. Quite often the students ask for a metal scouring pad to clean the outside too. We have to explain to them that we want them to remain blackened as they absorb heat better. A very impressive article, with some excellent posts in response. Can I make a couple of suggestions? Firstly, if you take a phone with you, make sure it’s fully charged. For preference, take an older model, not a smartphone; my Samsung Edge lasts for up to a week on a charge, not something you will hear smartphone users say! Also, while I know that Laplanders are much loved, don’t forget the Silky Pocketboy. I have one and use it in the maintenance of some woodland, and can’t recommend it highly enough. Wickedly sharp, very compact, and a joy to use; Lois Orford makes sheaths for them, and I’m going to treat myself to one in the New Year! You make good points and ones that I agree with. Even though I use the Laplander, I also rate the Pocketboy. I am a survivalist/prepper from Austria/Europe. Times are getting tough because of some crazy politicians – the more we will need bushcraft/survival to survive the looming WW 3. So I began to train some young people. And the results are give me hope for our future. I appreciate your article – these items I allways recommend + paracord+ fishhooks. I am already older and quite sick, so I need medicine to cope with my diseases. So I suggest to have always needed (and prescribed) medicine at hand. But anyone who cares for a first aid kit will of course have the needed medicine in it too. Perhaps I would put a hatchet to the bushcraft equipment too – but not necessarily. Thanks for your comments. Even though you are not as physically well as you might like, it’s very commendable you are teaching young people in useful life skills. 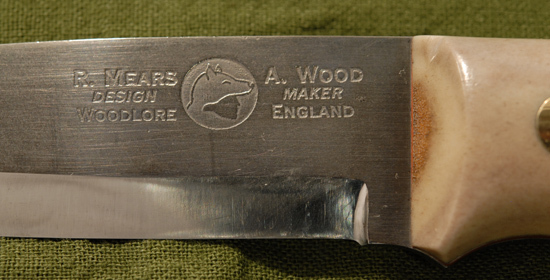 Hi, do you know anyone who might be interested in owning an original Alan wood instructors Woodlore knife which is 10 years old but not been used or sharpened only handled ? Which Woodlore instructor was the original recipient? I noticed in your leather belt , has two turns? ?how it works?? I’m sorry but I don’t understand your question. Could you perhaps phrase it a different way? the image looks like you have two belts, one on top of another!?!? As for these essentials does any one wanna get there hands on my real, genuine, 10 year old but unused Alan Wood Woodlore knife? 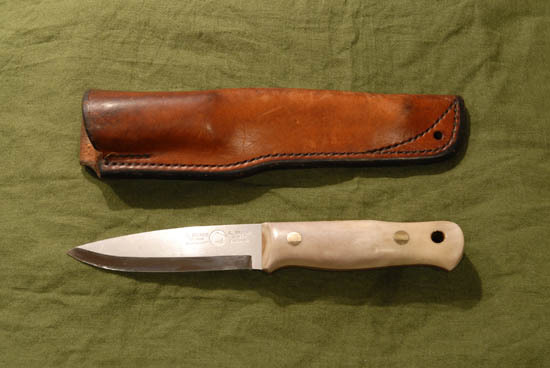 Which Woodlore instructor was this knife originally awarded to? Paul, how do you deal with the belt kit when carrying a backpack load that demands a frame and substantial waist belt? Where does the canteen & cup go then? My preference for a belt kit is largely for warm climates when I’m carrying little else. When I carry a rucksack, I put the canteen and cup in a side pocket. As you know, it’s important to get the weight of the pack on the hips and I don’t like anything which inhibits this. Great as always – thanks for the detailed information! What is the make / name of the tiny caribiner on your fire steel and where did you buy it from? I’ve never been able to find one that small and pocketable! Another great and detailed article, thank you! What is the make / brand of carabiner you have attached to your fire steel? Where did you buy it from? I can’t find one that small out here in Australia, even online! I really enjoy reading your articles about camping and bushcraft. They are very informative and make you think about what is only essential. I have one question that of all of the articles I’ve ever read, I never hear of anyone talking about what they use to clean their pans, and dishes after they eat. Have I missed something along the way or don’t you clean your pans after using them. Hi Dave, I usually use some grass and soil or moss, that is if I’ve enough water to rinse with. If water is short then just wiping out with moss will do. In deserts or near beaches you can just use sand (makes a perfectly clean finish.!). When I travel on extended overseas trips I have a small green scourer pad (very light) which I use for pans and for cleaning the crap off the ceramic water filter. A recognised list, but I had not considered the benefit of the steel mug before and have always just carried the plastic style. Having read your thoughts on it’s double use as a boiling receptacle it seems so obvious and will be an immediate purchase. My only extra’s, though alluded to in your blog are chlorine tabs or some other water purification as well as a couple of rehydration sachets as I personally sweat a lot and so need something extra to replenish lost salts. Final carry all is a small bottle of hand sanitizer. If only used just before eating or handling food, even a 60ml bottle can last a long time. In addition to your kit I include; Bacho Laplander saw, para cord and a small tactical light. I also wear a bandana for its myriad of uses. Thank you for sharing you knowledge and experience. Great to see this revisited. I follow your ‘Top 7’ almost to the letter. I would add a couple of things to the first aid kit: Inadine (an iodine, non-adhesive, sterile gauze; vital for keeping things clean) and a good pair of tweezers. I also might slip in a “Write-in-the-rain” notepad and a 2B pencil. With the general public increasingly concerned about knives and the people that carry them, I don’t always carry my fixed bladed knife, preferring to take a locking knife instead. I know that there are still legal issues over locking knives and they are not as dependable as fixed blades but, being in a pocket, they do not receive the anxious looks from the public. That said, I am lucky to live in an area wherethere are not many people about, so taking my fixed blade is usually not an issue. As I said earlier, this really is an excellent, well thought out article. Many thanks for this and all the other work you do. It makes sense if this is about essential wilderness equipment “strapped on one’s body at all times”. Your article made me think about where do I put the gear I carry when I’m outdoors. I have a sharpening stone and a first aid kit but in my bag. I could be 200 meters away collecting water or firewood. I would add a pair of good working leather gloves to your list. See, handling hot objects, dragging wood, foraging can be hard on the hands. I’d rather have them ON ME instead of the first aid kit, I prefer less cuts and less illnesses (an person touches its face 10-20 times / hour on average, if you have dirty hands, you’ll get sick eventually) than relying on bandaids and pills all the time. On knives: we all agree a knife is a tool to have, but I dont always carry a fixed blade. And even when backpacking, I have a Mora, but in my bag. I transfer it on me when I arrive at bivouac location and put it back in the bag when I leave in the morning. So it could eventually be lost/out of reach should a major incident happens. What I have on me everytime is a Swiss army knife (Victorinox farmer, the one with a saw). And truth be told, I wouldn’t feel terribly miserable with just that as a cutting tool. Did you wrote something about personnal survival kits already? Thanks for all your good work, be sure I’ll come back to read some more! Great ideas across the board – I was going to suggest wire for snares, etc but that got covered quickly. From experience, I would add some Uncle’s 100% DEET – smaller bottles are available- maybe a bug net? There`s only one question I have for you, in your picture of the seven things you would take with you what is in the top right hand shot of the picture its in leather . I`m not sure what this is. Heavy duty polythene bin liner(s) – take up very little room, weigh almost nothing, cost almost nothing yet have hundreds of survival and outdoor uses; from keeping kit and fire materials dry, cut open as a mini tarp over a fire lay in wet weather, a first aid burn dressing, Rambo raincoat or skirt, collect rainwater, collect drinking water from transpiration from bushes condensed inside poly bag, emergency floatation bladder for a water crossing ( better inside a jacket ) or a water carrying bladder ( inside a shirt ). You could write a whole article on 101 survival uses for a bin liner! After a wet week canoe touring in Norway’s Songefjord I learned you can never have too many plastic bags ( where possible I triple-bag anything sensitive! ). Mending kit – sturdy needle and polyester button thread for repairs to kit ( try carrying a 15kg rucsac any distance with a broken hip belt! ) or in a pinch to stitch a deep wound. Safety pins and a large steel thimble ( doubles as a low friction top bearing for a bow-drill ). Duct tape ( waterproof tinder ) wrapped around cheap poundshop cigarette lighter ( with a surprisingly good LED light inside). Lighting – tiny lightweight LED lithium battery head torch and perhaps a tea light candle to help as fire lighting ‘insurance’. Cordage – at least 2 metres paracord for bow-drill, plus 10 metres of 2mm Dynema and 20 metres of 1 mm braided Dynema fishing line ( 300lb breaking strain ) takes up very little room. First aid extras – 4” waterproof vacuum packed Israeli field dressing if likely to be using axe, knife or saw. Foil hypothermia blanket ( doubles as a signalling device ). I don’t usually carry all of this stuff in daily life but when out in the backwoods alone, or on a solo canoe expedition, a belt mounted ditch kit I can swim with would probably be a very good idea in future. Your thought are most welcome. Keep up the good work with your blog. This article is a very interesting one. I agree whith the items u carry. I also carry a DD3x3 tarp which i manage to pack to the size of a toilet roll. I also carry a hammock, Paracord and a very small and basic repairs and maintanance kit. I feel that these i tems allow me to survive in almost any environment without worries. Having said that, I do tend to carry the same few items when I go out to play and they’ve all been mentioned by others already. But I will add one item that I must have – my wide-brimmed hat. Keeps the sun out of my eyes, the rain off my head, holds a paracord headband, acts as a basket for fruit/berry/twig collecting, and will carry a pint of water from the pond to the campfire for a brew. I believe someone once said: If you want to get ahead get a hat. Must have been a bushcrafter ! Loving the articles and learning much. All the best. JK. Hi Paul, Great article. I have in my water bottle pouch (BCB Crusader pouch,mug and bottle) a Millbank bag, as an unexpected mouth full of sediment isn’t nice. and in addition to the cuts kit a set of tick removal tweezers or an Uncle Tom’s tick removal tools. Also i always have a torch or head lamp. Thanks for the articles and keep up the good work sharing your knowledge. Thanks for your comments. I’m very grateful you rate my podcasts so highly. I hope I continue to stay at the top of your list. Please do feel free to ask questions for #AskPaulKirtley and suggest guest for the Paul Kirtley Podcast. It’s good to read what additional items you add to your list of essential items. Thanks for sharing. I’m quite new here but I wouldn’t bring my wetstone with me for a walk in the woods (it would stay in the main camp or at home). If a knife is wel sharpned ot will stay that way for some time and even if you can’t get to your camp before it loses the edge its possible to use some other stone. So i would replace the stone with a mobilephone (only fot emergencies and light source). Would bring some parachord and a isotermic emergency blanket. Also i would putsome iodine on the first aid kit. A lot of great comments here. I’ve found having a haversack to be a great piece of my kit. It’s a simple canvas bag with one large pocket. I take it even when I have a backpack. Great for picking up things along the way – tinder, edibles, etc, and carrying a few more items like cordage, and a kerchief. Obviously no good when the canoe tips over, but I like having it. In my daily homestead life it’s a knife, saw and fire steel as a given. In various locations around the property are med kits and if I have to venture off property a small med kit, water, mug, rubber inner tube pieces and a lighter/matches(as a kit) come too. I now also carry a piece of polishing compound, my belt does the rest. But it’s the knife that goes on as soon as I get up in the morning and remains there until bedtime. I feel naked now without it. Life is impossible or tedious without it. And interestingly my mp3/camera . Photos, podcasts, journal etc. Until the power gives out the black mirror is king. Easy now and greetings from BG. 6’c damp but still able to make fire. Great article, I’ll be sharimg this one immediately. Pretty much exactly where I ended up for a personal kit over the years by trial and error, with the only difference being I always have a little pocket knife as well. Two is one and all that. Never underestimate a god mirror. When you’re alone in the wild a mirror is perfect for checking yourself for ticks at odd places. Most of your body is invissible for your own eyes without a mirror. Than I would, as more replies have written, add a pencil and a smal notebook indeed. My Victorinox EvoWood 17, only leaves my person when I’m sleeping indoors, at home. Mostly you don’t have to use a big knife but need the comfort of a small, do it all is very pleasant. If I could add Something to the kit list, it would be a roll of jute twine as it serves as cordage for shelter building etc, and when fluffed up it also takes a spark very easily aiding in fire starting, making it a dual use piece of kit. Thanks for all your great content and help. il start of with saying thank you for all the great knowledge and tips you share with us, always interesting to listen to ask paul kirtley on soundcloud or youtube and read your blog posts. i also follow you on instagram and think its a good platform to interact and share information. keep up the good work! Looks like a well reflected and thought out set of equipment you use and its realistic approach. for most i would get along pretty well outdoors with my set of kit thats equal to yours. the only two things i would change out is that cup and bottle and the honing stone. 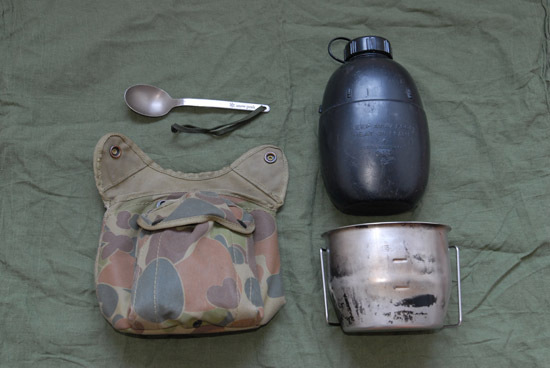 i would change the cup and bottle with my 1L nalgene bottle and either a swedish mess kit or my coffe pot 1.4L. And for the honing tool i would definatly changed it out with my jerven hunter bag. My choise of tools is not based on the all so romanticised and imaginary scenario of “what if im stranded with only 7 tools”, but rather everyday life outdoors like hunting, fishing, hiking and camping where this kit works in a system with other kit as well. You could possibly add some parachute cord to that survival list. its light weight and easy to carry on you if you make a paracord bracelet out of it, the parachute cord its self can hold 550LBS and is made out of nylon, very durable and could help with shelters or towing or anything like that! Great article, thanks for writing it. I like to carry a piece of fat wood, or Birch bark. But this is mainly due to the fact my fire lighting skills are in early development and it’s a bit of security, that goes hand in hand with my Fero rod, I also carry an 8 hour burning time Tea light candle. Great article! Two additional items I always have on my person are a cotton handkerchief and a multitool in a belt pouch. Great article! Two additional items I have on my person are a cotton handkerchief and a multi-tool in a belt pouch. Great list… The only thing I’d really want to add to that is a Major Trauma/Emergency Bandage. I’ve done numerous first aiding courses and the only thing (aside from ‘staying alive, staying alive) that sticks with me is just how useful those things are. Commonly called the Israeli Bandage it’s just something that could absolutely save your life. Accidents happen. Sharp knives, cold wet hands and inhospitable environments are part of what being outdoors is all about. Wouldn’t leave home without one… so your list (which I completely agree with) plus one of those. Hi Paul, thanks for your articles and videos. I’m picking up lots of stuff to back up my limited knowledge of bushcraft. I “came late to the party” at 60 last year, though I’ve been hillwalking since my twenties. Bushcraft has opened my eyes to lots of things I’d previously walked past on my quest to “bag another ridge”. Now a couple of miles in my local woods takes as long as a full days ridge walk! I’m learning so much about myself as a person too. Who knew I’d have the patience to persevere with fire from friction with a bow drill? Not me for sure but I have! I agree with your 7 and without realising it I had adopted these already. I have added a folding hand saw, mobile phone and a small pouch of already collected and “ready peeled” Silver Birch shavings. The pouch is one of those very light dog treat bags and with this I can pretty much light a decent fire anywhere, even with damp kindling. If I use them I just collect more on my way home, ready for next time. Hi Paul, thanks very much for all of your blogs they are full of usefull information. My tools i carry vary slightly from yours, in that i use a EKA combi saw rather than a Laplander, with a neck knife(Boker 2 inch) which i use for skinning, a Falkniven A1 as my main knife, a Gransfor small forest axe and a Real Steel Bushcraft Knife. Each knife has a certain area of use because of blade length and the axe is just the biz. But my question is do you think it is a mistake to carry a saw which is larger and therefore more cumbersome to carry against having a far more varied usage? Thanks anyway for all your articles and the time you must spend on them. I would just add that I always carry an Israeli bandage as a primary in my first aid kit. It is really situational and the article speaks about survival and bushcraft. Personally I make a distinction there. Survival is something that happens to me when I don’t expect it. Bushcraft is something I plan for and the equipment I bring is what I think best for the given environment and situation. Including emergencies. I’ve only been in two ‘survival’ situations so far in my 43 years of life. One was in Russia and one was in Senegal. In Russia the most important tool I had with me was a mobile phone. In Senegal the most important tool I had with me was US dollars. My bushcraft gear usually is more extensive. But I think what you described in the article would be part of my day pack, whereas I’d leave heavier gear in the camp. I’d certainly want to have a good amount of paracord and wire with me. Depending on where I am a fishing hook or pocket fishing pole set. I don’t know. It really depends on the where, when, how far out, what possible dangers. Etc. This is a great guide for a keen amateur like me! Thanks for sharing paul, this post was really well put together. Thanks Jake. Glad you liked it.
. . . I agree on the basics . . . However, unpolluted water is an increasingly scarce commodity . . . I know this is an old post, but still. I can see your 7 items beeing useful for almost all kind of outdoor activities and trips. Question: Sins this is a post from 2010, have you changed any of the items during this last 8 years? If so, why? To the firesteel; Yes it is a unique tool that overcomes any other fire making tool in terms of lifespan, robustness and simplicity. But there are some issues with the uses of the fire steel that is not much focused on in sosial medias like youtube and so on. Even at certain survival courses it is not given enough attention. I have seen that even some instructors are not experienced enough in use of the fire steel in bad weather. They pick up some dried fine birch bark for a demo and gets it burning after some strikes. but it is rearly when the sun is shining and the air is dry you need a fire going quickly. Bad weather is one of the main reasons for ending up in some kind of emergency/survival situation. I grew up with the rule of carrying a box of matches in my pocket. So I will gladly admitt that I struggled myself in the beginning with the fire steel, even though I have made fires for years before my first fire steel. Some years ago I became interested in primitive methods, and bowdrill became an obsession. Learning and practicing friction fires made me stronger in choosing and preparing the right tinder under the different conditions. The knowlendge from this, and then specially from preparing the nest of tinder have been extremely valuable for all kind of fire making subsequently. I feel that not all of the people that are trusting their fire steel as the only source of fire, actually are able to use it when it counts. How are your views on it? Do you see the same pattern from students who have been on other courses before yours? If you find this topic interesting you can shorten this comment and put the questions in your Ask Paul Kirtley series to enlighten this important side of the use of a fire steel. To practice in bad weather conditions. My experience is that many outdoors people out there needs it. Just to be clear, I do carry a fire steel, and I think it is an amazing tool. Hello Paul, one additional item that I consider essential to carry on your person here in Australia or any country that has venomous snakes is a separate snake bite kit that contains 3 long elastic bandages that can be used to wrap an arm or leg if bitten to slow the spread of venom till proper medical treatment can be reached. I have a kit in the home and car as well. I enjoy seeing snakes but never interfer with them. Thanks Peter. Since I’m severely near sited and wear contacts, a pair of glasses are added to my list. And since in an emergency, such as getting wet in winter (I live in Alaska) I may need a fire fast with numb fingers I also include a waterproof bag of cotton balls and some matches. Great article, I’m loving your site and podcasts. Paul! Loved this vlog! There’s only one thing I’d add for obvious reasons. Paracord. The 7 things will do me. If I need anything else, it can be made. 10 items is an arbitrary number and 8 an somewhat bemused it forms a benchmark. The first time I was lost (genuinely), I only had the clothes I was wearing. Learning resourcefulness and non reliance on having it with you are excellent skills/motivation to adapt and work solutions. Thanks for your comments. Glad you liked the choice seven items. I would not leave home without a mobile phone on the list, yes its a relatively new invention with no ties to bushcraft . A mobile can be used for fire starting, signal mirror, cutting tool, source of knowledge, making a compass & of course for calling for help. Good, pragmatic and practical suggestion Geordie. Thanks for putting out all these great articles for everyone to enjoy. I tried to be concise with this reply, but it turned out quite long instead. I like wilderness living as much as the next guy, and certainly value all of the kit you mention in this article. I can even see the charm of challenging oneself to try and live off these seven essentials (in a controlled way). But, like most everyone else, I take quite a bit more than the bare essentials when I know I will be staying out for any number of days. I think the critical takeaway of this article is this: what happens when things go wrong – and you find yourself separated from your main pack, or your campsite? The gear that you will have on your person at that particular moment plays a large role in your ability to rebound from these situations. So, here are my thoughts on the three specific scenarios you mention: getting lost from camp, losing your pack during a river crossing or losing your pack due to a canoe capsize. 1. Getting lost from camp – If there are other people still in your camp, your best bet to find your way back is a signaling whistle. No further equipment needed. If you are going at it alone (or out of whistling reach), be sure to take a GPS device, and mark the campsite location before leaving it. When you have trouble finding your way back, just switch on that homing device. All nice and good in trying to go primitive, but there is no shame in using some modernities to avert disaster. 2. Losing your pack during a river crossing – The first consideration here is prevention. When alone in front of a deep / swift river, strongly consider not crossing at all. When you are with 2 persons or more, there are ways that you can secure yourselves with lines to make things more safe. Your pack can cross separately from you, just dragged across on a line as well. 3. Losing your pack due to a canoe capsize – Of course you secured your pack to the boat. If possible, make an effort to retrieve the boat (and thus the pack). Things that should be on your person to help this process: cordage (to lasso it in), folding saw (to quickly cut smallish trees that might be used to “bridge” to the boat). 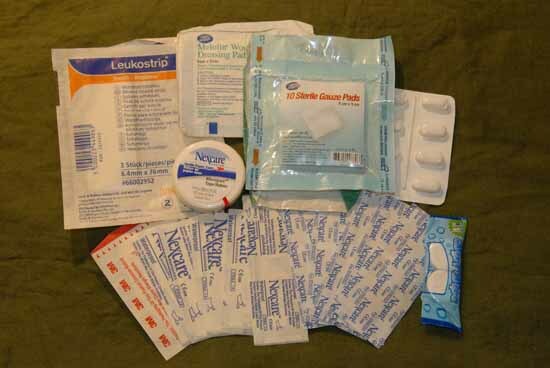 If all is still lost even after the above preventive methods, I would be happy to have some of the other essentials as well, while walking back to the trail head or waiting for the rescue party. Except instead of the mug & bottle I would include a Sawyer mini (less bulky), and I really don’t see much point in having a compass (without a map). Oh, and one more thing which really can’t be called an essential, but I never fail to bring a pair of cut-resistant working gloves as well. Let’s just say I’d rather not have to use my cuts kit at all. I like your list, Paul. For me, the list would differ depending on where I’m located (which country and climate). I’d definitely take a good knife, but I’d also probably want to take my laplander folding saw. And I like to carry tinder fungus. One more thing: I’d pay very close attention to what clothes I’m wearing, since they are the first form of shelter and can be used for all kinds of purposes (for example cut into bandages, or used as cordage, not to mention you could make a net out of them, and use them for filtering water). And in some survival instances, you could actually eat them. Some indigenous arctic cultures used to do this with their skin clothes, in hard times of deep winter conditions. Obviously this does not apply to the modern, synthetic fabrics that most people choose to wear!